LONDON, England (CNN) -- Some of the biggest names in global finance say they have lost hundreds of millions of dollars in an alleged $50 billion "pyramid scheme" that led to the arrest of a New York financier last week. 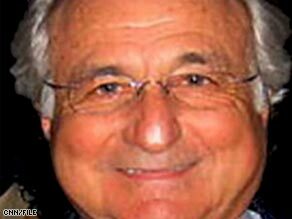 Bernard Madoff was arrested Thursday on a single securities fraud charge. HSBC, one of the world's largest banking groups, could lose $1 billion, it announced Monday, adding to a litany of expected losses across some of Europe's leading financial houses. The Royal Bank of Scotland told CNN its hedge funds had exposure of up to £400 million ($600 million) to funds managed by securities broker Bernard Madoff. In France, BNP Paribas said Sunday its maximum potential loss was about €350 million euros ($468 million). And in Spain, Banco Santander said it had a direct exposure of €17 million while clients of its hedge funds had €2.33 billion at risk in Madoff's firm. The country's second-largest bank, BBVA, said it could lose up to €300 million. Japan's Nomura on Monday said it had ¥27.6 billion ($303 million) of exposure, but that the impact on its capital would be limited. "It is extraordinary the broad section of people who have admitted some involvement," he said. "There is a real trail getting back to the basics of these deals -- but all speculative at the moment." Madoff, a former chairman of the Nasdaq exchange market, was arrested Thursday on a single securities fraud charge for operating a $50 billion Ponzi scheme from his investment advisory business. A federal court in Manhattan Friday issued a temporary order freezing Madoff's assets and appointing a receiver over him and his firm, his global securities broker company, Bernard L. Madoff Investment Securities (BMIS). According to the complaint filed with the U.S. District Court of Southern New York, two senior employees of BMIS told investigators that Madoff ran the advisory business from a separate floor of the securities firm offices. One of the senior employees said that Madoff kept the advisory business' financial records under lock and key and was "cryptic" about its business.